The CP690 cotton picker will be at Agritechnica 2017. This self-propelled machine, which packs the cotton into round bales onboard, will be on show at Agritechnica for the first time. 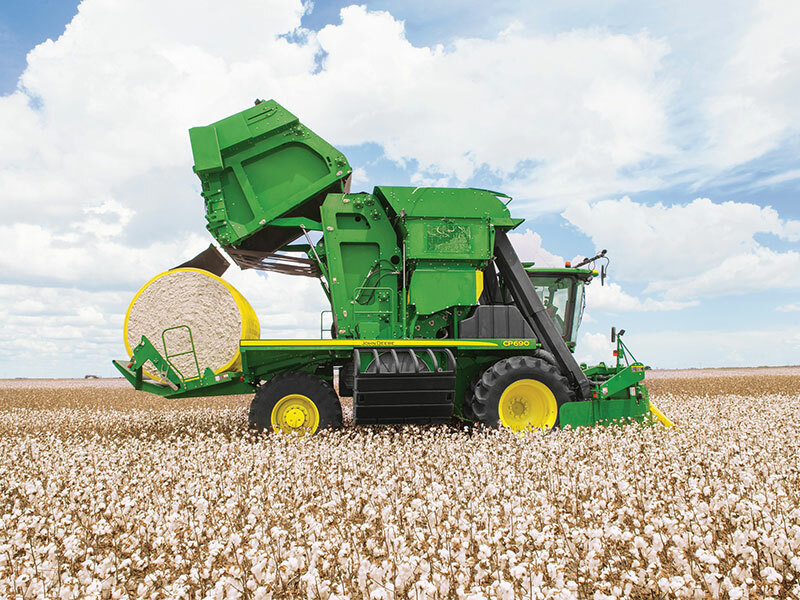 Key features of the machine’s technology includes round bale moisture sensing, round bale weighing, harvest identification, Cotton Pro and the John Deere Operations Centre Field Analyser app, which enables a cotton producer to protect seed cotton quality while increasing harvest productivity and minimising the cost of harvest. Producing round bales of around two tonnes in weight, this harvester is a one-stop shop for cotton farmers and protects cotton quality from the weather by wrapping the bale as well. The new round bale moisture sensor removes the guesswork from the cotton producer on when to start and finish harvesting for the day. 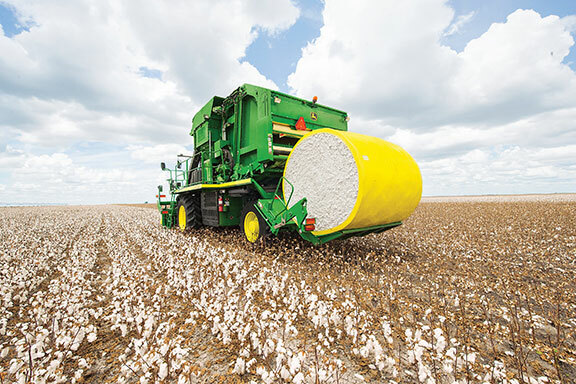 Real-time feedback in the cab of the cotton harvester allows the producer to stop harvesting when moisture approaches 12 per cent to preserve cotton quality and the cotton grower’s profit. This is a standard feature on all CP690 and CS690 cotton harvesters sold around the world. On-board round bale weighing removes the burden of transporting them from the field to the yard to get the weights required to calibrate the harvester’s yield monitor. The real-time round bale weight displayed in the cab allows the producer to calibrate the yield monitor based on individual fields and varieties. The John Deere CP690 will be on show at Agritechnica for the first time.